There are few things in life that I like more than hiking. It’s just great to be able to see something in the distance, throw some stuff on your back and know that you can get there in a few hours or days or whatever. There’s a real satisfaction and flow to moving through a space propelled by your own two feet. You notice sights, and sounds and smells and the landscape keeps changing all the time. For me hiking moves at the perfect pace. Its fast and engaging enough that you can lose yourself in your thoughts and observation, but usually not so strenuous that you can’t focus on anything but breaking through the pain. Of course it is that too sometimes. 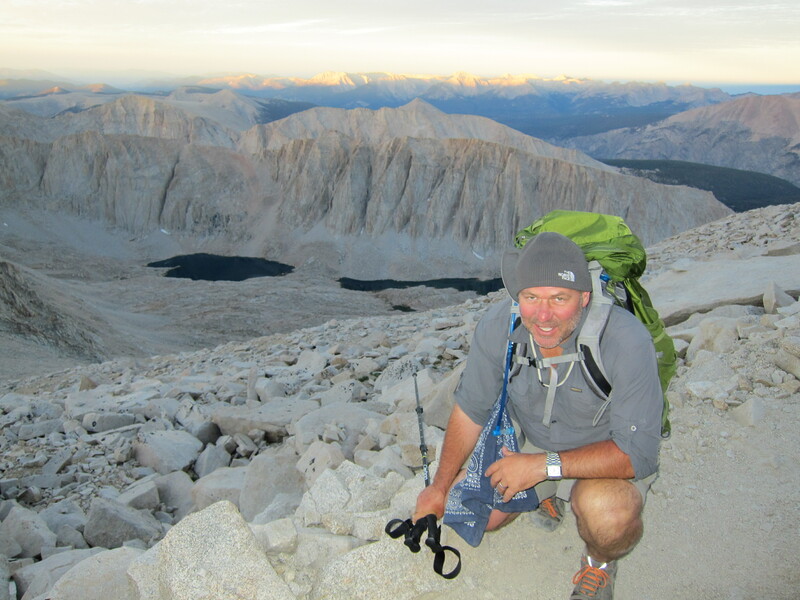 We usually hike pretty fast, so it’s definitely challenging, but for me…for thinking, resetting and feeling at one with the universe, there’s nothing like it. That’s me with my brothers and my grandfather. We got our start hiking pretty early. Here we’re in front of our house in town carrying bundles of wood. It’s different when you’re hiking for fun and games and when you’re doing it because you are working the mountain. Running cows, sheep, and goats to high pasture, cutting hay, chopping wood, and building shelter. 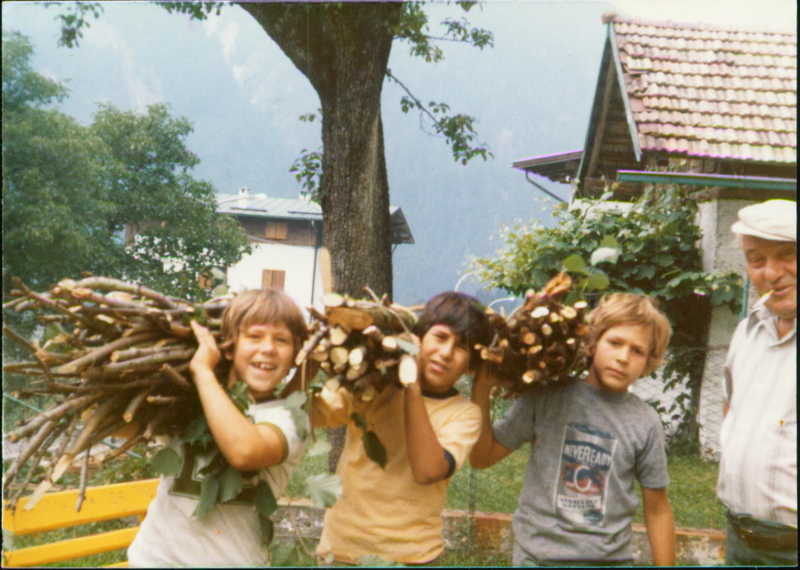 When we were kids, most of the people around us were from the generation where going into the mountains was work. Hard, often back-breaking work. The thing that’s amazing is that it was enjoyed anyway so much by the people who did it. The sublime sense of the mountains was in these people. Lowlands, sloth, normal life just didn’t cut it for them. You’ll notice my grandfather is smoking a cigarette. Even at his age there and with a cigarette, he was still walking in the mountains. Slow and steady…always on the look out for a mushroom or berries. Here we are learning lesson one of working the mountain. Never walk anywhere and come back empty-handed. If you walked over hill and dale, you better make sure you’re bringing back some firewood, some mushrooms, roots or whatever. 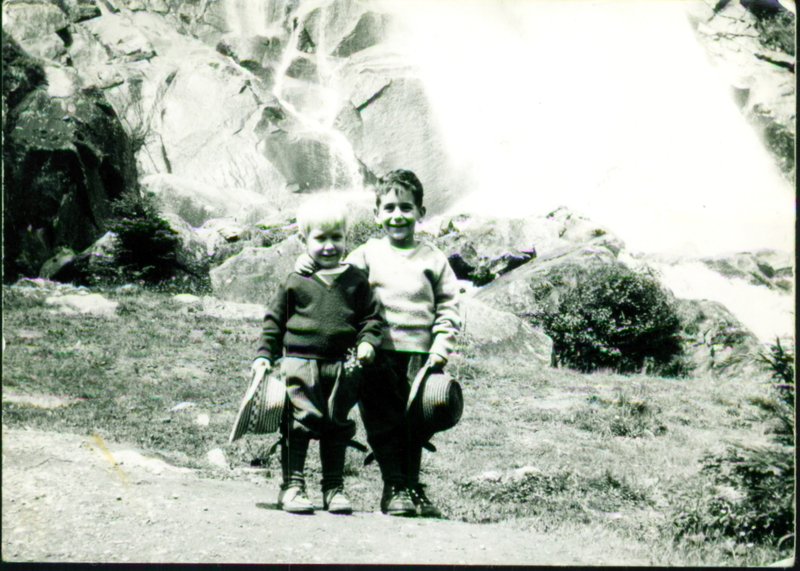 These are my older brothers at the Cascata di Nardis in Val Genova. It’s a beautiful waterfall that flows from the Adamello glacier not far from our home town. Check out the swank jr. sized hiking boots and knee-length corduroy hikers. And what about those hats? I think they were hipsters before there were hipsters.